The Maid of the Loch paddle steamer was being taken from the water for restoration work when it slipped its ties and broke free, forcing members of the restoration team to run from the side of the vessel as it re-entered the water. 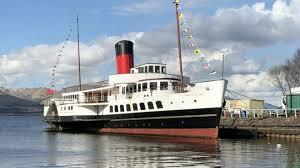 It was taken back to its normal berth at Balloch Pier and work called off for the day. Efforts are being made to discover what caused the ship to slip back into the water. The Maid of the Loch entered service in 1953, the same year as the Queen's coronation but though the ship remained watertight copper piping and artefacts were removed, and disappeared. The Paddle Steamer Preservation Society has been given £950,000 by the Sottish Government towards restoration, and the Loch Lomond Steamship Company (LLSC) have given another £50,000 to go toward repairing the hull and engines. The full restoration is expected to cost £5.5m. Once £1.7m is raised, the Heritage Lottery Fund will release £3.8m of further funding. The LLSC hopes both the ship and slipway will get industrial museum status.